Here is where I have got to so far. The term “Clockophone” derives from two words; “clock” and “phone” the first implies a “clockwork” mechanism and the second is from the Greek “phonos” or sound. So it is a device that makes sound and is driven by a clockwork mechanism. Clockophones first appeared in the early 19th century, the model I am hoping to reproduce was made in 1856 and continued to be developed up to 1939, when a little skirmish in Europe halted development and led to the piece being lost in a bombing raid. In the early days they were “programmed” by hand and a fan-fold card of played notes (achieved by punching holes in the card) activated the instruments within the device. The clockwork mechanism was there to provide for the timing and was driven by a large weight. It had a variable length pendulum that “kept the beat” (much like a metronome) and hand cranked bellows (operated by one’s servants) to provide air for the organ pipes and other wind instruments. Mechanical power for the percussion, etc. was also provided by one’s servants turning capstans - much like they used on old sailing ships to raise the anchor. These devices were developed over time to take account of new technologies - such as a steam engine to provide power instead of servants - more politically correct I think - and during the early 20th century, valve electronics to augment/replace some of the instruments, lamps to replace the candles and electric motors to replace the steam engine, which had to be kept well away from the room where the instrument was housed due to the noise - this was also true for the servants, but for different reasons. This image also shows the pendulum with the weight about half way up - the nearer the top the faster it goes. So here we have it started, I will be choosing a suitable piece of music shortly for the animation, which will determine how many channels I must animate. This particular Clockophone had a great variety of instruments and displays available, including a small train that went around its front stage (not made yet) that carried some percussion pieces. General construction was a wooden frame, extensive carving and ornate plasterwork, with some cast brackets, adornments, etc. 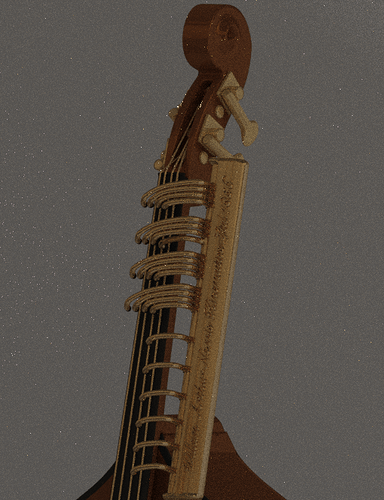 I hope to be able to reproduce these all in fine detail as befits the original instrument. 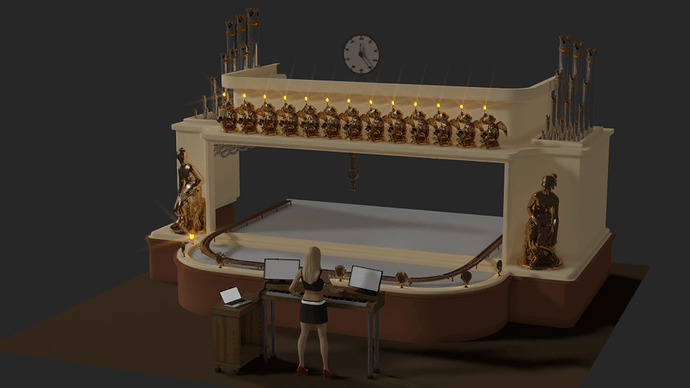 Organ pipes added and train track - many of the materials are just place holders for now. I have also got the clock face working - this counts the bars based upon the Time Signature and Beats Per Minute derived from the MIDI file by my MIDI Bake node. I also have the pendulum swinging and the weight moving, again derived from the Beats Per Minute and Offset values from my MIDI Bake node. 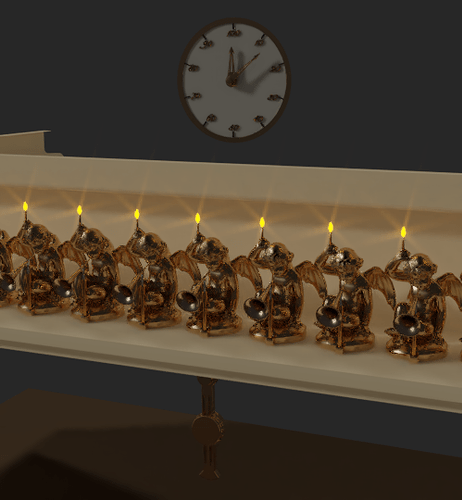 Offset is the start frame for the music based animation, I have the option to move this up the timeline so the music doesn’t start on frame 1. Hi Shaun, where have you been all this time, I thought you had fallen of the planet! 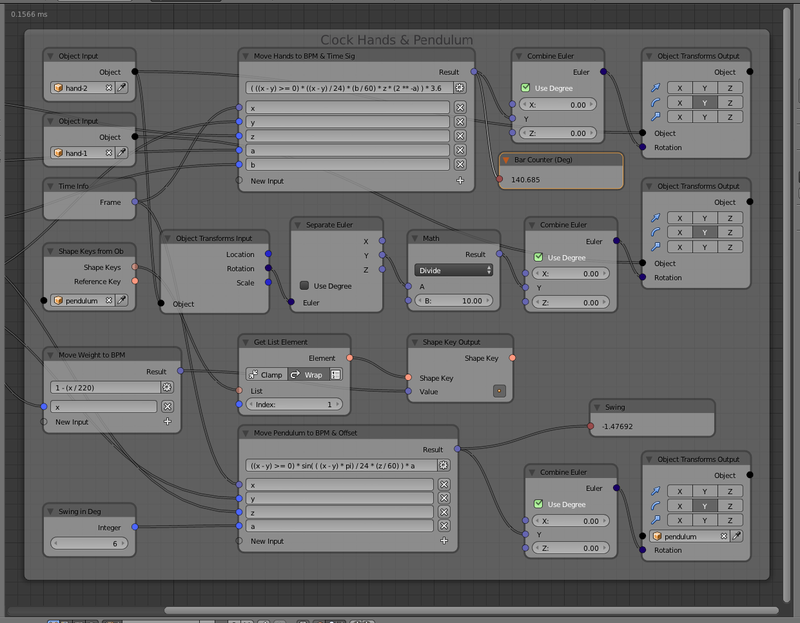 I am well, but have been very busy making MIDI sync nodes for Animation Nodes so I can animate to music once more without having to have Blender 2.49 on my Mac to get the animations done. The old script was a little clunky, but my new one seems to work well - I have a few examples in a thread in the Animations section here. Anyway I am visiting your country in January - departing Southampton early Jan to arrive in Capetown later that month on the Queen Mary 2 with stops in Tenerife, Madeira and Namibia. What are you up to Blender wise these days? Spent the best of the 1st part of the year struggling with health issues, seem to be over it now. You are going to love Cape Town, everyone who goes there cannot believe the place. Maybe you will not want to leave! Busy with a Star Destroyer at the moment, but not enough done to start a thread. Ah Well, Ahem, Honey is one of my favourite little @%&^(&(#&. Nice young lady. I have still to add the master shaft down to the sequencer module, two bevel gear trains and some other bits, then I must add the sides for the clock and some mounting brackets, etc. That is because you are the Master and we are just the students !! A very ambitious project indeed, as always looking forward to this. BTW where has your website gone ? Looks great, and is totally nuts! It must have taken some serious study to get that deep into rigging automated animations. 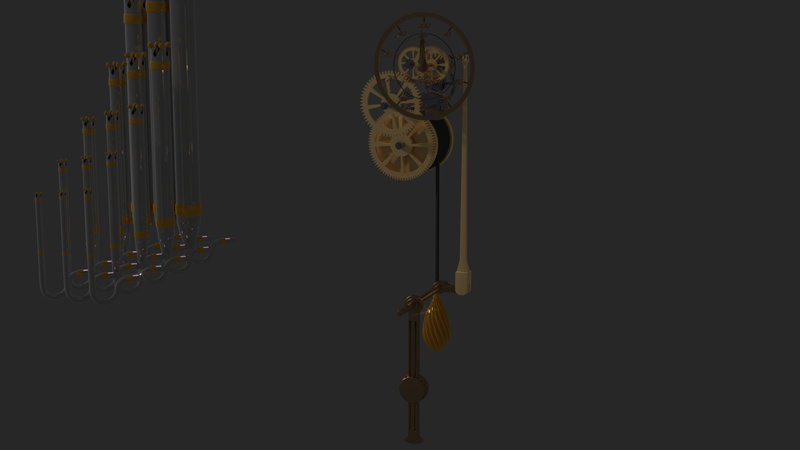 I have done a couple of simple mechanical rigs but couldn’t begin to comprehend the complexity of something like this. You should write a book on how you build all these complex controls for mechanical rigs. I am eagerly awaiting the first animation. Thank you all for the kind comment chaps! Now you have embarrassed me :o I don’t classify myself as a “Master”, but I enjoy these mechanical models! The error was that the “Separate Euler” node in the middle was working in Radians not degrees, I forgot to check the “Use Degrees” box. I tend to take a piecemeal approach to these AN rigs, just do one bit at a time and then the node tree just builds up. I also tend to label the nodes so I know what they do, it makes life easier later on as the complexity grows. I intend to document the process on my website, once I find a good host and have some time to do it properly. 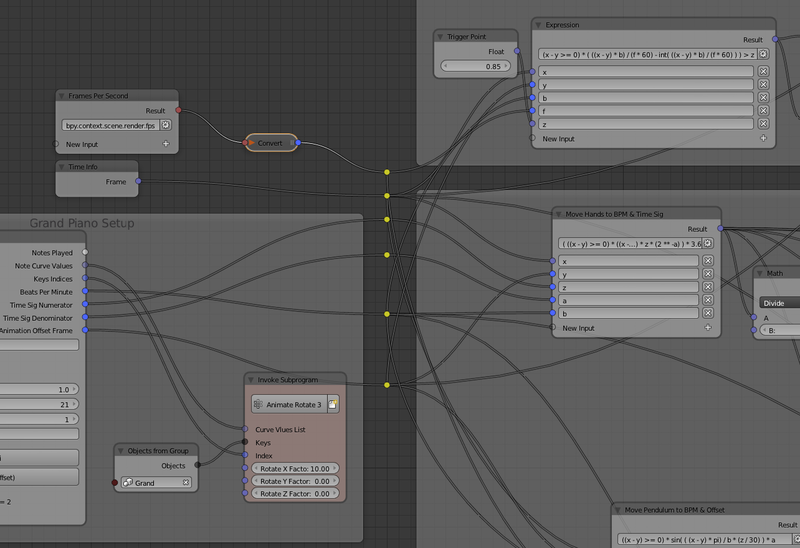 I really like Animation Nodes - it provides good framework and is easier to do as a procedural process rather than using drivers/constraints and keyframes. I have added the drive shaft to the sequencer, some more AN nodes to control it and the grand piano. It seems there are several piano/organ WIPs at the moment, I wonder if others are going to get their projects to play music, if so I will make my MIDI nodes available to use. They are in Alpha testing just now, I want to make sure I cannot break the code before I release it officially. 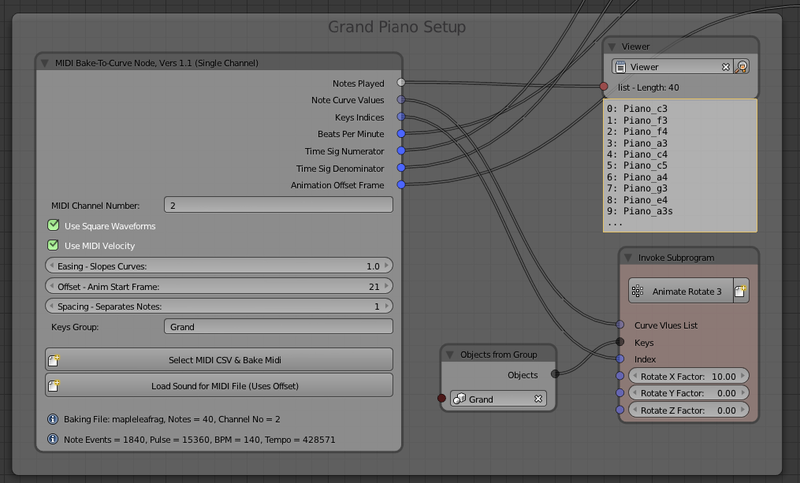 Testing is going well, the latest video on my YouTube channel was all done with my MIDI Bake node and a few other little node trees… I have the system driving location, rotation and scale factors along with both single and multiple shapekeys - oh yes and material changes as well. 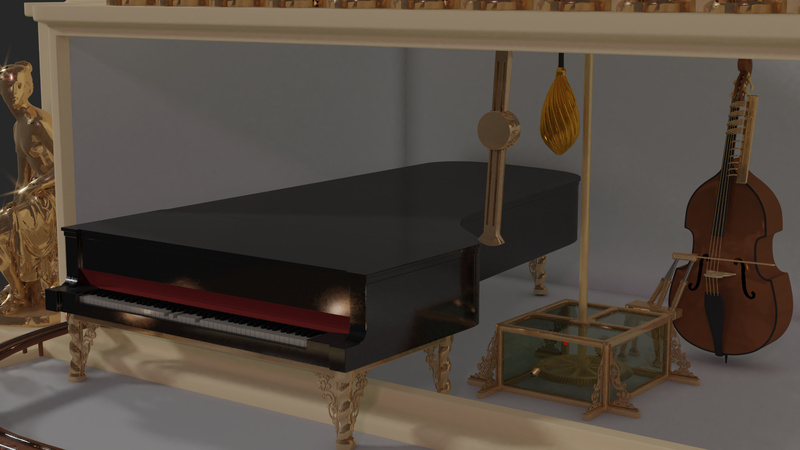 The piano won’t have an internal frame and strings, I don’t think that would add to the project, but it will have a “card reader” that is supposed to represent how the original machine was animated - this will feature a moving image taken from Reason Sequencer window and some drive motors, etc. 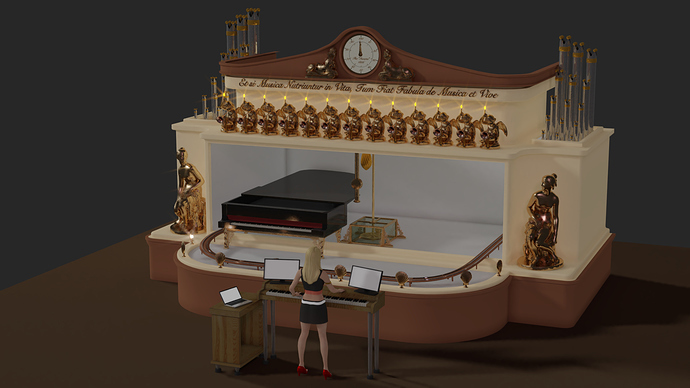 The project is really about MIDI Sync animation not “can I model an accurate grand piano”. Next thing to add is the double bass - with a curious device to hold the notes on the strings - a mimic of a hand if you like and a device to pluck the strings. I know how I want to do this, just have to build it! I am also going to animate Honey so she plays her “input” keyboard as a test, this is quite complex as I have to move her hands and fingers in time with the notes played, but one of her fingers will play multiple notes, so I have to come up with a schema to do that, not easy me thinks! I am actually just here to see the vid where Honey shakes her arse. I mean plays the keyboard. On a more serious note, what you are doing here is really nice. Super also that you will share with the community. It uses my standard Loop to rotate the keys as seen in previous posts on my thread in the Animations Section. The various output sockets go off to other bits to drive various things, including the beat light, pendulum and clock mechanism. I have added the “player” for the Double Bass, some history; in 1848 William Arthur Norris Kinematics Ltd. developed a device to play the 'Cello called a 'Cellomatic - why is there a ’ in front of it, well the proper name is a Violin-Cello - that’s why. :yes: This device would hold down the strings using rubber ended fingers and play the bow across the correct string, a most ingenious device indeed and revolutionary for its time. The device could be scaled up to accommodate a double bass as was installed on the original “Invicta”. Whilst experimenting I found a really annoying bug/feature in Blender, if you make an object, then rotate it about it’s X axis and don’t apply the rotation, then try to rotate it about it’s own local Z axis (key R ZZ, etc) it changes all three rotation boxes - f***ing annoying as you cannot then animate it using AN Transform Output node, grrrr :mad: Oh well, used an armature instead, easy to drive from AN. 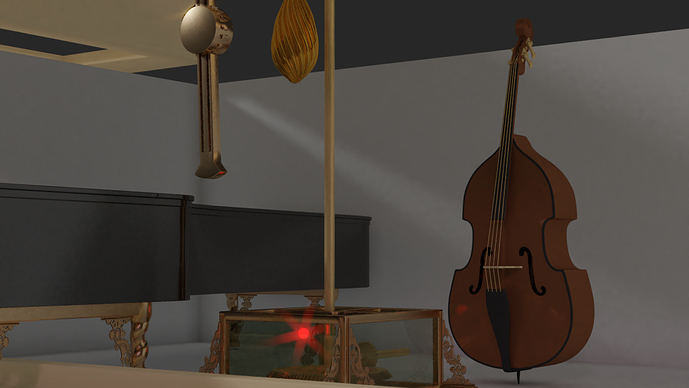 Next, I will transfer the project to my server and render a Piano and Double Bass exert from Maple Leaf Rag. Thanks for saying so my friend, that is most kind. AN only has a Transform Output node that works in Global axes, it would be really nice if it could be persuaded to work in Local axes, maybe I should have a word with Jacques (writer of AN). How to feed your animation node tree with the Frames Per Second as stored in your blend file. I really like those two monitors she has there, nice big screens, 38C? Next video currently cooking - it will show between 1500 and 2000 frames of Maple Leaf Rag piano and bass. It is currently taking about 2 min 20 secs per frame on my server.